Saguaro National Park surprised us around every turn. It had been a long time since either of us had hiked in the desert, and we didn’t know what to expect. Kristin went in with low expectations, and she ended up loving the park. Here are our favorite spots in the park, along with some tips for visiting. We hope they help you plan your trip! Backpacking to Manning Camp – What an adventure. Going all the way to the top of the park, from the lower desert elevation to a high elevation conifer forest. It was strenuous, difficult, and a blast. I would return to the park just to do this trip again, and we definitely will someday. I feel we didn’t get enough time to really explore it with only a 3-day backpacking trip. 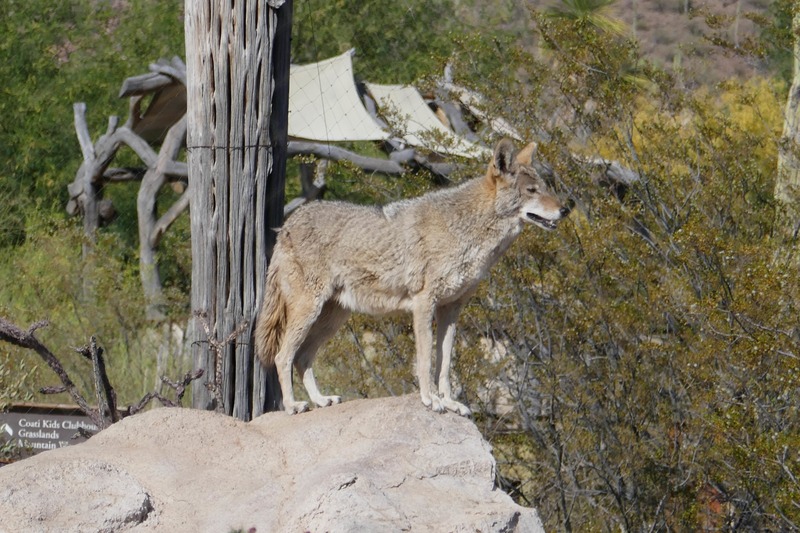 Arizona-Sonora Desert Museum – This is outside the park, but only barely. It taught us so much about the desert ecosystem. It was tremendously important for understanding the plants and animals that live here. Highly recommended. 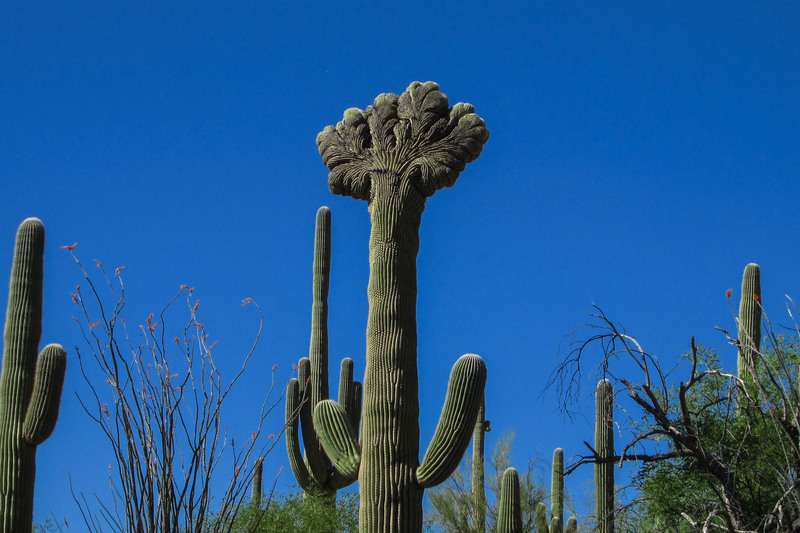 Saguaro Cacti – Seeing the namesake of the park, the saguaro, was a highlight. Especially when we saw it blooming! Obviously they are prevalent in many areas of the park, but some trails, like Wasson Peak, have particularly nice views. Others, like Garwood Trail, had unique sights like a cristate version, and a cluster of 11 saguaros. Manning Camp – Our three-day backpacking trip took up almost half of our time in the park, and it was well worth it. The route took us through a variety of biomes. The weather was a nice escape from the desert heat, and there are many trails up there to explore. The spring at Manning Camp is breathtaking; it can’t be captured in a photo (believe me, we tried). Plus, as far as I’m aware, it’s the only backcountry campground in the park where the pit toilets are fully enclosed. 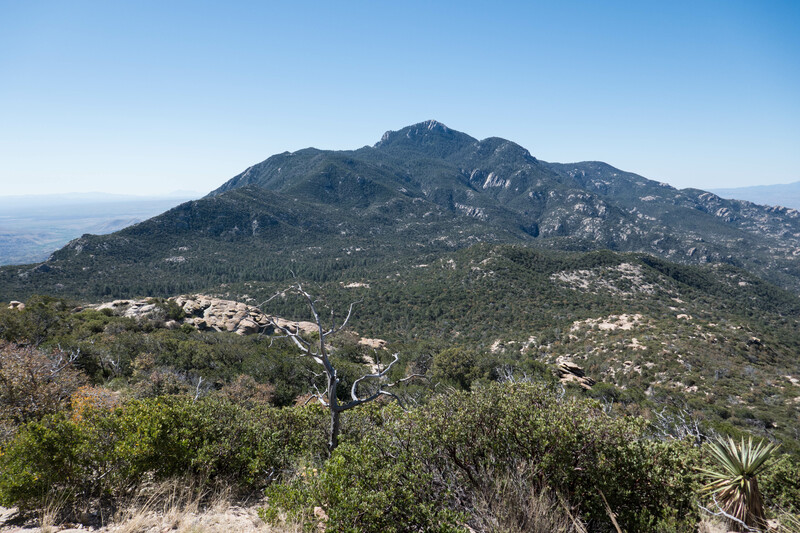 Wasson Peak – This was my favorite day hike in the Tucson Mountain district. The views are gorgeous, the terrain is varied, and there are some cool landmarks along the route that speak to the park’s history. And the breeze at the peak provided a refreshing respite from the desert heat. Signal Hill Petroglyphs – The largest petroglyph site in the park and the reason to drive the Bajada Loop. 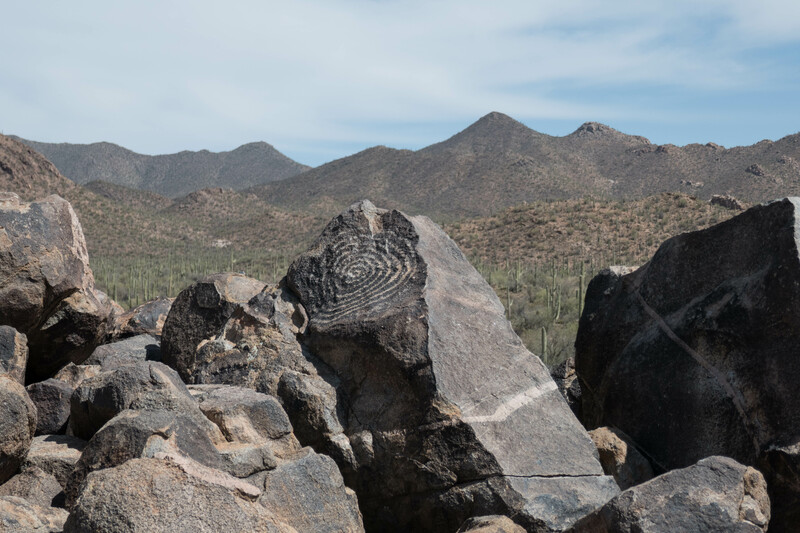 A brief walk up a rocky hill takes you to a series of petroglyphs that were created between 550 and 1550 years ago by the Hohokam Native Americans. The views are nice for such a short hike, and it’s a good spot for photography, too. Honorable mention: Tucson food scene. Much like we experienced in Saguaro National Park itself, I was pleasantly surprised – this time by the amount of high-quality and different varieties of cuisine we were able to try during our trip. If you go to Saguaro, take advantage of Tucson’s proximity to the park. Hike to Rincon Peak – This hike is near Happy Valley Campground, but we just didn’t have enough time (or extra potable water) to make the trip. Next time, we’ll either do it as a day hike or extend our backpacking trip by one day. Other backcountry trails – We only saw a bit of the backcountry on the eastern side of Manning Camp. 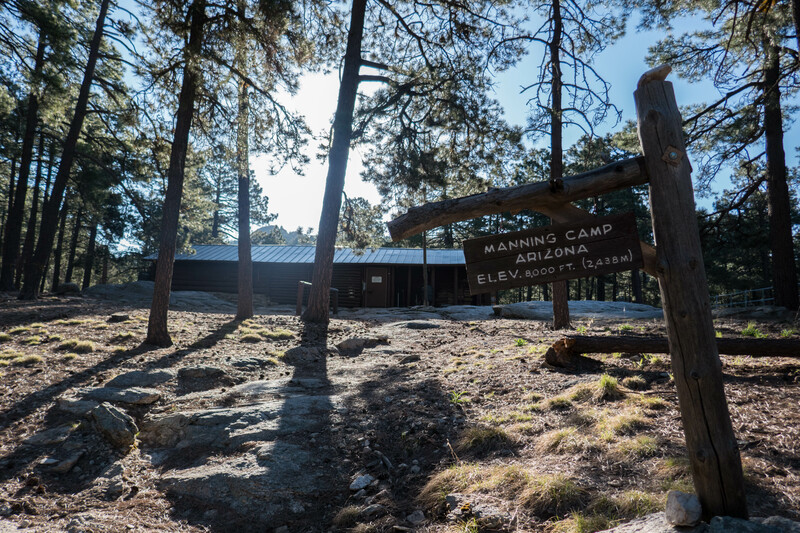 We’d love to check out trails on the western side of Manning Camp like Tanque Verde or Douglas Spring. We would also like to spend two nights at Manning Camp to explore the trails and beautiful scenery up there. This is doable since Manning Camp has a spring that flows year-round. 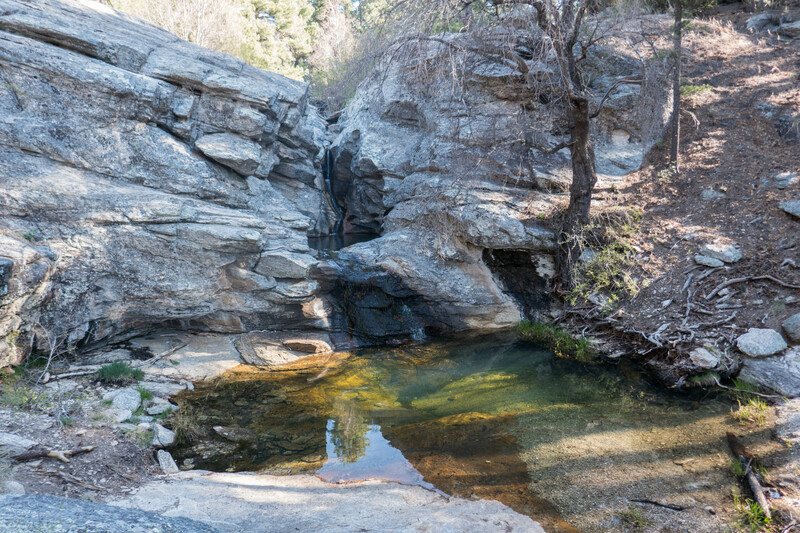 More time in the Cactus Forest – This is located in the northwest corner of the Rincon Mountain (east) District. We got to do a short hike to Garwood Dam there, but there are so many intersecting trails. We were tired from our backpacking trip, otherwise we would have explored more. Riding horses – I’m not sure if we’d be interested in this, but we’d investigate the possibility for our next trip. We generally only post about places we visit for a longer amount of time. 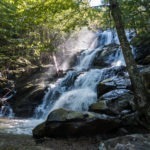 But we also checked out a few smaller sites, events, and hikes in the park that are worth mentioning. Desert Discovery Nature Trail – A 0.4 mile loop, and one of two ADA trails in the park. We stopped here while trying to get a sunset photo and found this short loop with interpretive signs. We were lucky enough to see a woodpecker fly into its nest in a saguaro! 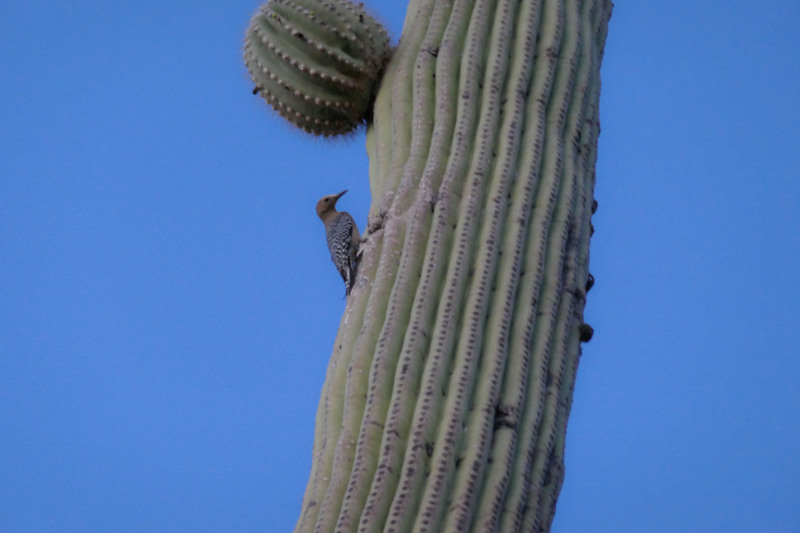 A Gila Woodpecker (Melanerpes uropygialis), about to go inside its hole in a saguaro. Photographed on the Discovery Desert Trail. Cactus Forest Loop Drive – This is the paved driving loop in the east district. We found that we liked it more than the Bajada Loop Drive in the west district. There were some overlooks, views, and trails along the way. We enjoyed driving it at sunset. 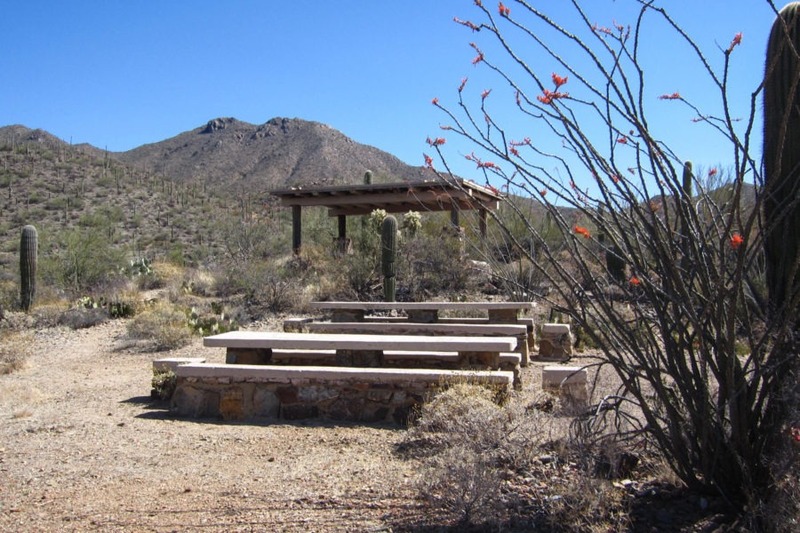 Desert Ecology Trail – The second short ADA trail in the park, which is along the Cactus Forest Loop Drive. It’s only 0.3 miles, so it’s a nice quick walk with some more interpretive signs along the way. This view at an overlook on the Cactus Forest Loop Drive used to have hundreds of saguaros. Due to grazing and some cold snaps, a lot of young saguaros died. After the park acquired the grazing rights, young saguaro are growing again, but they’ll take years to get to where they used to be. 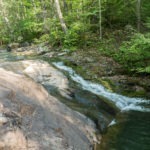 Freeman Homestead Trail – A short 0.9 mile trail, this was the last hike we did in the park. I really wanted to see a Gila monster and a ranger mentioned they had seen one along this trail. Gila monsters come out more in the early morning or late afternoon, so we went in the late afternoon hoping to see one, but no luck. The trail itself was an easy hike with some history about the area before it become a park. Star Party – An astronomy event held in the Rincon Mountain Visitor Center. 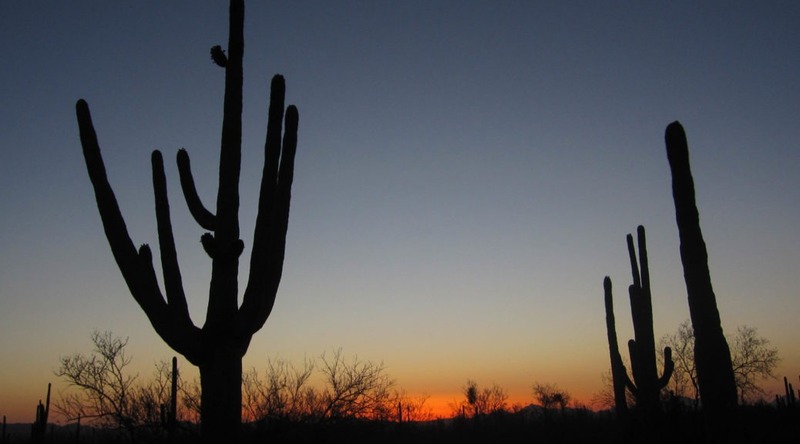 A ranger-led presentation discussed Tucson’s dark skies and detailed the history of the park. Afterward, visitors got a chance to stargaze in the parking lot, where members of the Tucson Amateur Astronomy Association had set up 5-6 telescopes. The volunteers were knowledgeable and friendly, and it was quite an experience to stargaze this close to an urban area. We signed up for this event ahead of time, and we’re guessing it filled to capacity, so sign up early if you’re interested! Offered October through April, highly recommended. 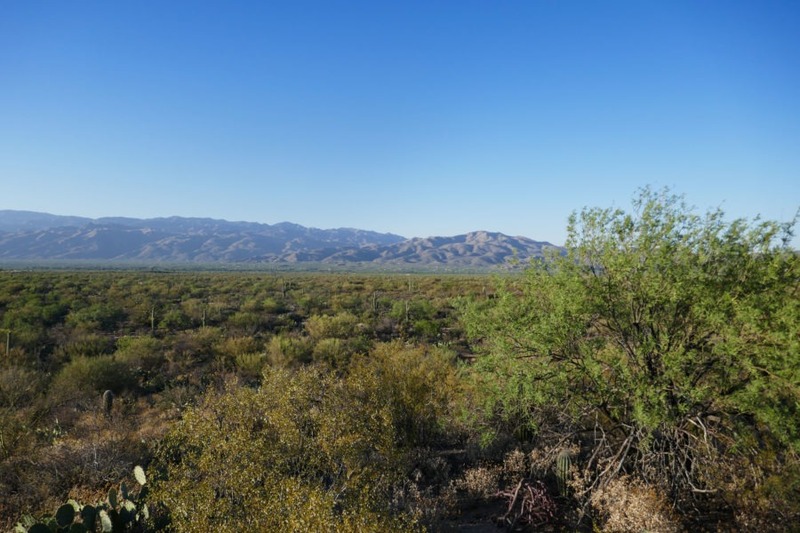 Tanque Verde Trail – We had originally planned to take this trail to Manning Camp, but started at Miller Creek instead. We decided to do an out-and-back hike on Tanque Verde. We were only on the trail for about an hour, and it was similar to other hikes we had done, so we weren’t super impressed with it. But this was at the end of our trip, and we were exhausted, so your opinion might differ. It would be interesting to take the trail further into the backcountry and experience the changing ecosystems as you ascend. This trail is lacking in shade, so we recommend checking it out in cooler weather. 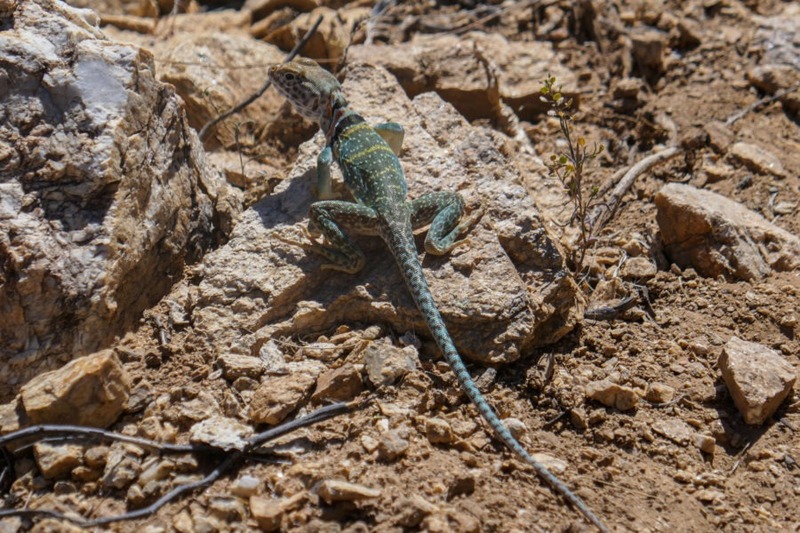 An eastern collared lizard (Crotaphytus collaris) on Tanque Verde Trail. Probably the most colorful lizard we saw in the park! 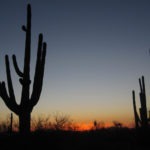 Sunset – We drove around looking for the best place to capture a beautiful orange sunset with saguaros in the foreground. But we missed our opportunity to find the spot that had been recommended to us. Lesson learned – if you see a gorgeous sunset, just stop and enjoy it while you can. Like any desert hiking, start as early as possible. We did the best we could, but still ended up hiking during the hottest time of day. Bring more water and snacks than you think you’ll need. Go during spring or fall, avoid the summer heat. Winter might be nice too, especially if you see the rare snow on the saguaro cacti. 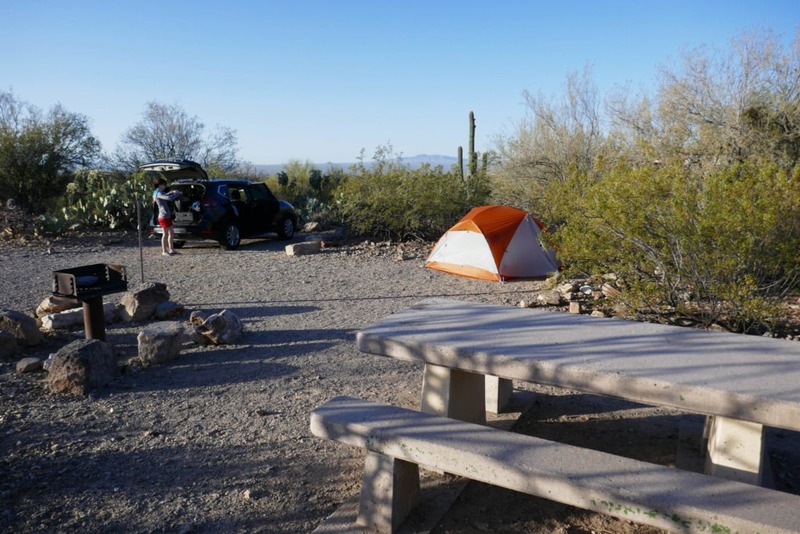 Gilbert Ray Campground is a great place to stay to explore the Tucson Mountain District. Grab a tent-only spot if you can. Get a high-clearance vehicle, especially if going to the Miller Creek or Turkey Creek trailheads. If you only have a couple days, explore the Tucson Mountain District. 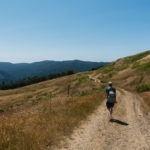 If you have more time, add a backpacking trip in Rincon Mountain District. Another option: skip Tucson Mountain District entirely and plan a 3-plus-day backpacking trip in the Rincon Mountain District. 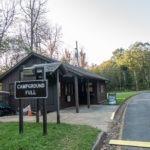 Give yourself enough time to explore Manning Camp and the surrounding area. We recommend at least one full day. Tucson is right there – great restaurants and more places to explore. Stay alert. This park is wild, and we ran into a western diamondback rattlesnake in the middle of Garwood Trail.